Hi, my name is Erica and I blog over at 5 Little Monsters. I have been crafting for pretty much as long as I can remember. I grew up watching my mom make things and she is the one who taught me to sew and crochet, two of the things you will see a lot of on my blog. Over the past few years I have spent a lot of time crocheting and I found that I really enjoy creating my own patterns. About a year and a half ago I decided to start a blog so that I could share my patterns. 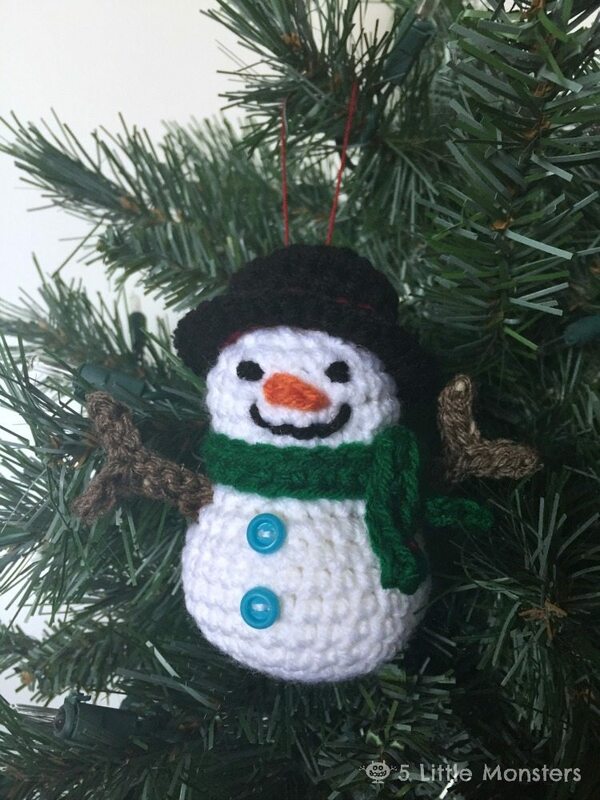 Today I am sharing the pattern for a crocheted snowman ornament. 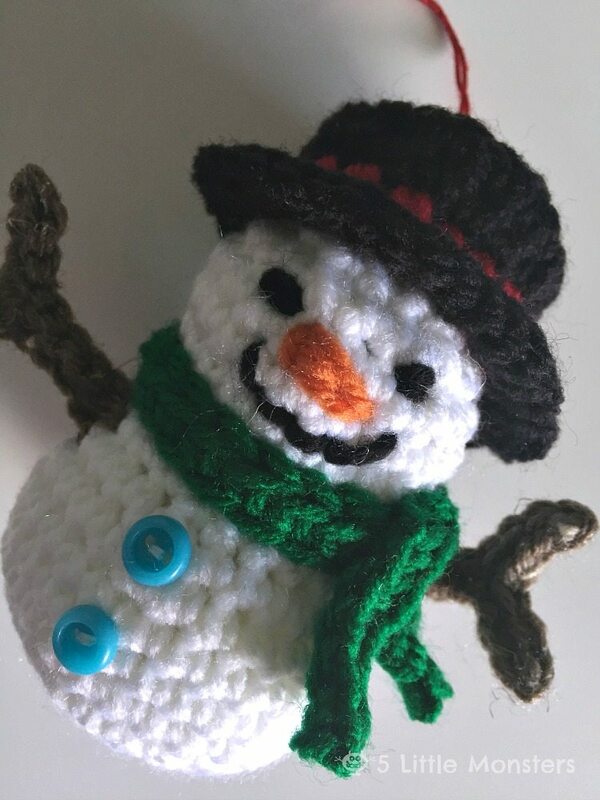 This little snowman is based on a Santa ornament that I made a couple of weeks ago. 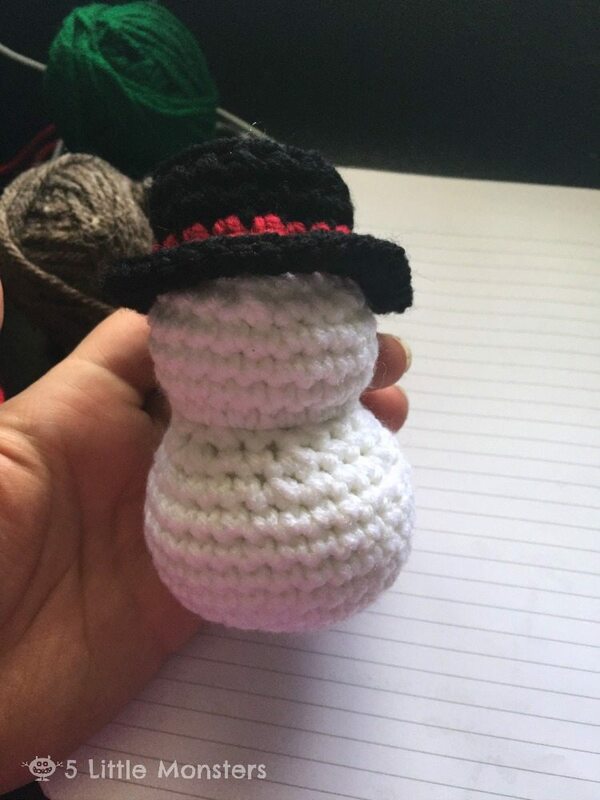 I thought it would be fun to make a few different ornaments that were a similar size and shape and the shape, a smaller ball on top of a bigger ball, immediately made me think of a snowman so I decided that needed to be the next ornament I made. 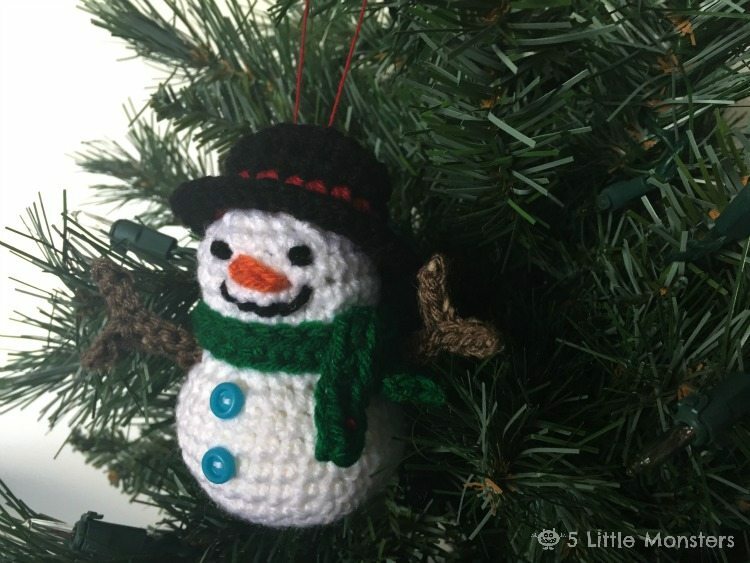 The little stuffed snowman is about 4 inches tall. 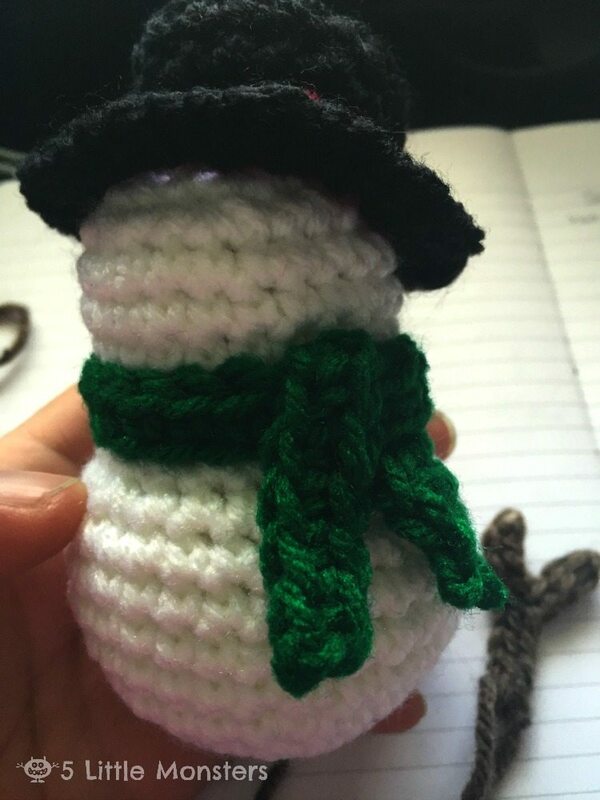 The head and body are crocheted in one piece and the hat, scarf, and arms are crocheted separately and sewn on. The face is stitched on with yarn and small buttons are added to the front of the belly. 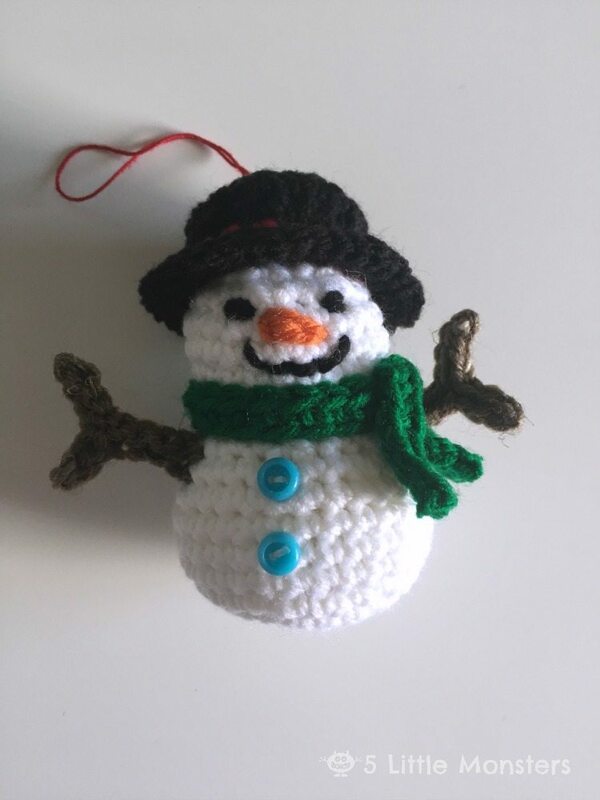 It is a pretty quick crochet project thanks to the small size and it will be a cute little addition to your Christmas tree. 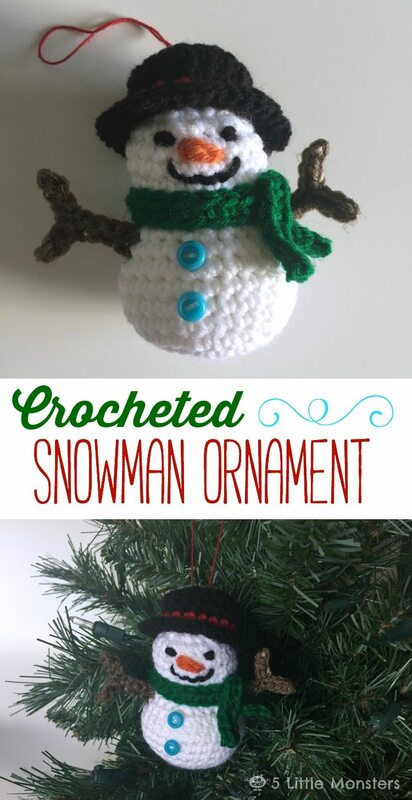 Now you have a cute little snowman ornament to hang on your tree. « Creativity Unleashed Link Party #95 and Moen Giveaway! Oh – I know several people who will be getting one of these this Christmas! I am pinning but it will have to be to a secret board for now as they are all fellow pinners! What a cute pattern, thanks! Hi Julie! I’m so glad that you like the pattern. Make sure to visit Erica’s blog for more great patterns! Merry Christmas. Absolutely adorable! I can’t wait to make these! 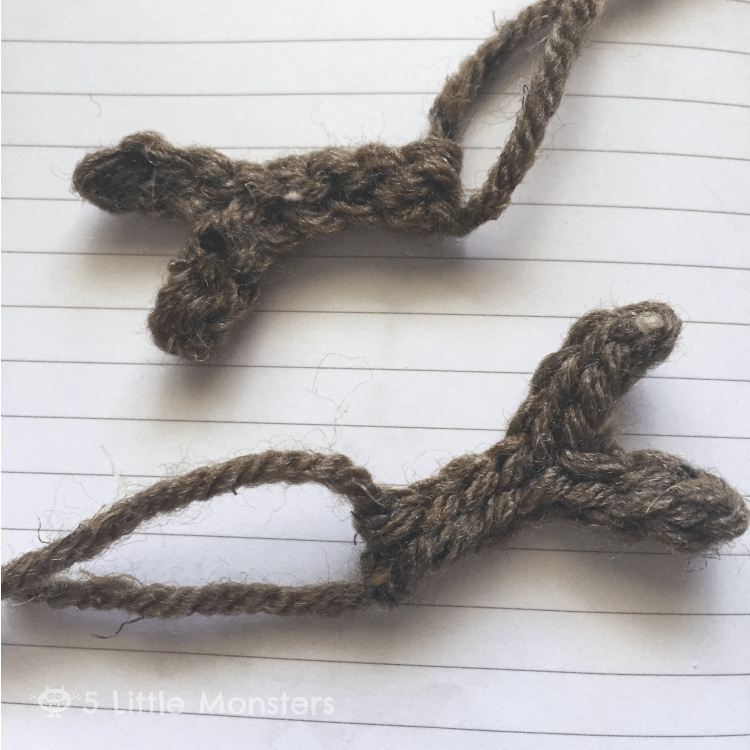 I’ve only been crocheting for about 1 1/2 years, can you tell me what “in mr” means? Thanks! !